"I dreamt up this recipe on my way home from work one night to use the ingredients I had on hand. It's a great comfort food for chilly winter evenings!" Preheat oven to 400 degrees F (200 degrees C). Lightly grease a medium baking dish. Bring a large pot of lightly salted water to a boil. Place fusilli pasta in the pot, cook for 8 to 10 minutes, until al dente, and drain. Heat the oil in a skillet over medium heat. Place chicken in the skillet, and season with minced onion, salt and pepper, garlic powder, basil, and parsley. Cook until chicken juices run clear. Mix in the cooked pasta, cream of chicken soup, cream of mushroom soup, and mixed vegetables. Transfer to the prepared baking dish. In a small bowl, mix the bread crumbs, Parmesan cheese, and butter. Spread evenly over the casserole. Bake 30 minutes in the preheated oven until bubbly and lightly browned. 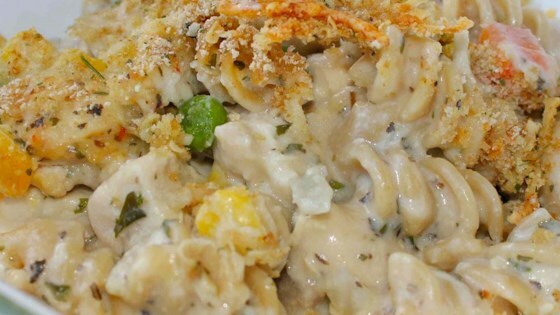 Try this hearty noodle casserole with chicken tenders and vegetables. I had a loaf of 2 or 3 day old beer bread on hand, which is great for the bread crumbs in this recipe because it's crumbly anyway, and its sweet flavor is even better when it's buttery and crispy! okay as a casserole. needed some milk or water with the soup to make it creamier.